Description: This discounted bundle includes all 3 videos from Dan Weiss' follow-up drum lesson series. 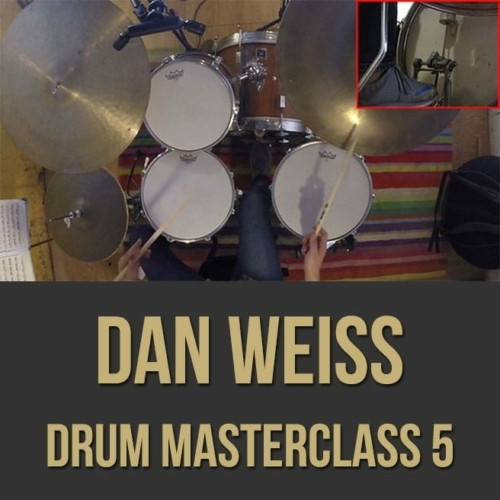 Video 3: In the first part of this follow-up drum lesson series, professional drummer Dan Weiss gives you some great tips and exercises to help improve your drumming. Dan discusses bass drum control, rudiment exercises, limb interplay, stickings and more. 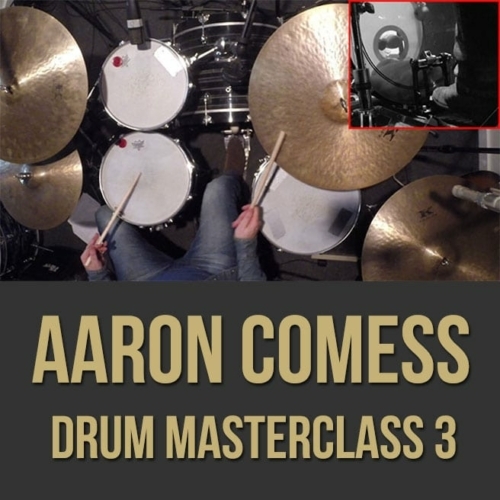 If you want to take your jazz drumming to the next level, this masterclass series is for you. 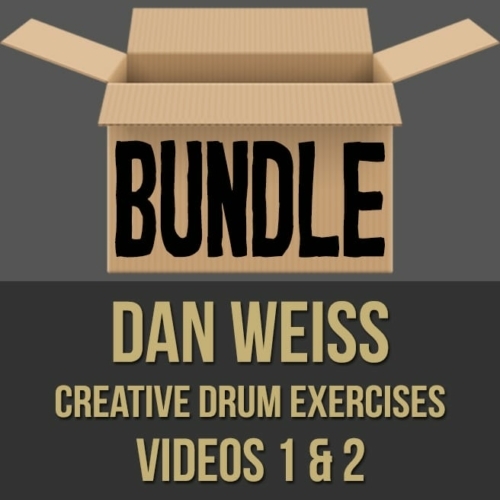 Topics Covered: Drums, bass drum control, feathering, swing, independence, dynamics, patterns, core drum exercises, the trunk, movement, stickings, accents, creative rudiment exercises, limb interplay, rudiments with feet and hands, etc. 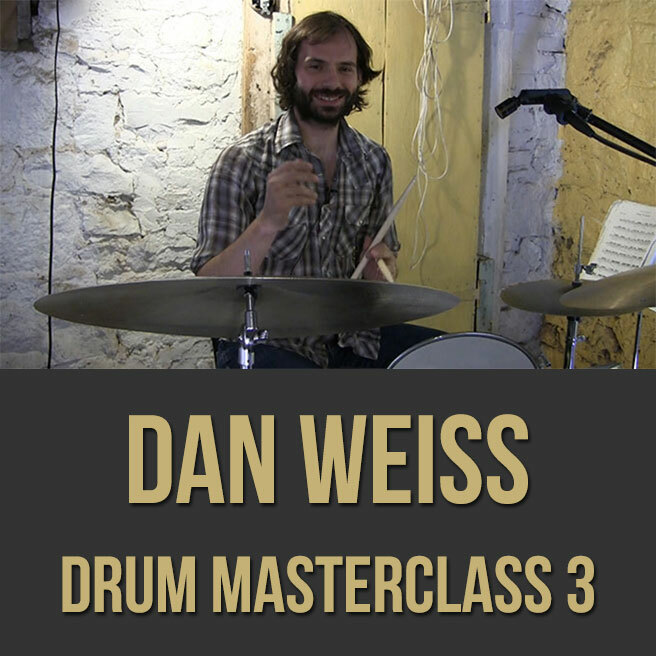 Video 4: In the second part of this follow-up drum lesson series, professional drummer Dan Weiss gives you some great tips and exercises to help improve your drumming. 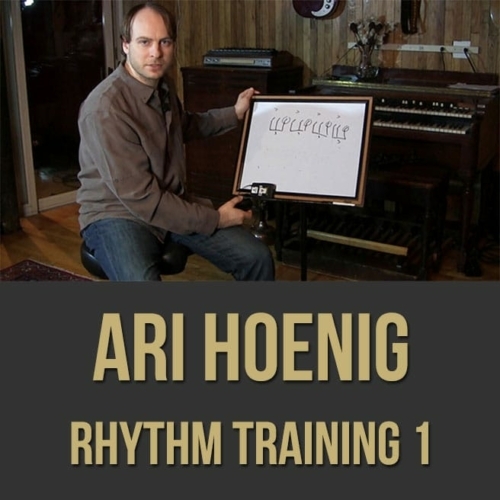 Dan discusses phrases, right hand independence, metric modulation and more. 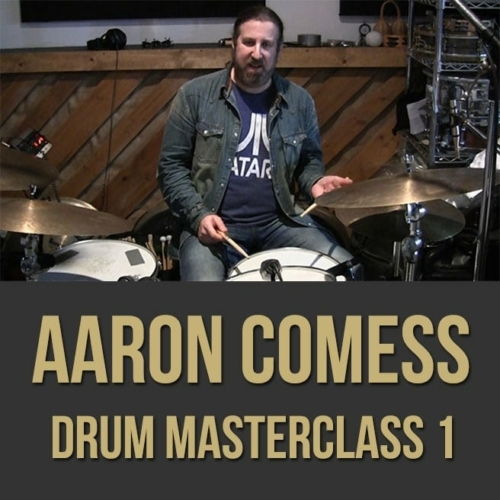 If you want to take your jazz drumming to the next level, this drum masterclass series is for you. 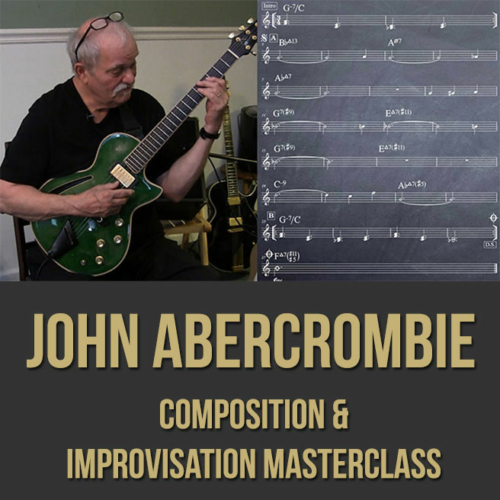 Topics Covered: Drums, breathing exercises, interpreting phrases, reinventing phrases, solos, permutations, smaller elements, using space, changing rates of speed, ostinato exercise, developing right hand freedom, limb independence, metric modulation, going between zones, etc. Video 5: In the third part of this follow-up drum lesson series, professional drummer and tabla player Dan Weiss gives you some great tools to help free up your drumming and improvisations. Dan discusses using Indian music elements and concepts to give you fluidity in creating new sounds, textures and rhythms. 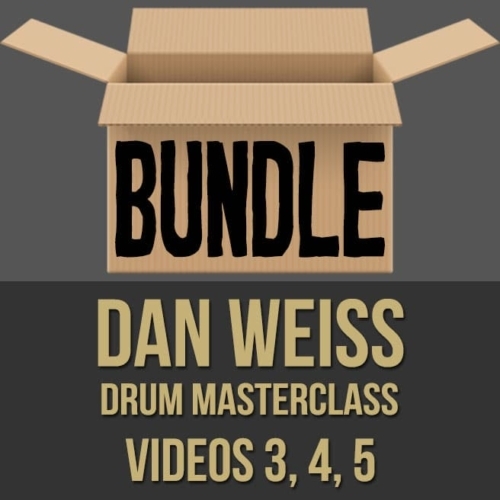 If you want to take your drumming to the next level, this drum masterclass series is for you. Topics Covered: Drums, adapting tabla compositions to drum set, Rela, Gat, using tabla elements in various genres, reciting rhythms, Applying table phrases in different situations, theme and variation, being creative with these tabla phrases, etc. Dan Weiss began playing the drums at the age of 6. He received his bachelor’s degree at Manhattan School of Music with a major in jazz percussion and minor in classical composition. Soon after getting his formal education, he began touring the world and recording with musicians such as David Binney, Lee Konitz, Rudresh Mahantthapa, Miguel Zenon, Kenny Werner and many others. 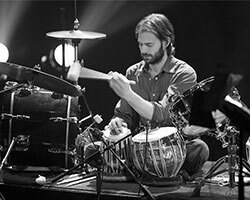 In addition to the drums, Weiss has been studying the tabla under his guru Pandit Samir Chatterjee for almost 20 years. This apprenticeship has been a major influence in his musical aesthetic, exemplified in two of his records where he performs classical Indian repertoire on drum set. David Adler All About Jazz ) wrote, “Weiss is arguably unique among today’s jazz drummers, transposing ideas from his tabla study to the drum kit, as heard most clearly on Tintal Drum Set Solo (Chhandayan , 2005) and Jhaptal Drum Set Solo.” Weiss was also named ‘The Top Up and Coming Percussionist’ 2 years in a row in the 60th and 61st annual Downbeat’s Critic’s Poll and was featured in the New York Times as ‘One of the 5 Most Promising Drummers of the New Generation’. Weiss has led his trio, which includes Jacob Sacks on piano and Thomas Morgan on bass, for over a decade. Their two releases, “Now Yes When” and “Timshel” have been critically acclaimed for their unique approach to song structure and endlessly creative improvisation. Weiss’ most ambitious work to date is a 14 piece ensemble composition that features a rhythm section, horns, voices, harp, percussion and organ. This much anticipated album will be released in the spring of 2014. 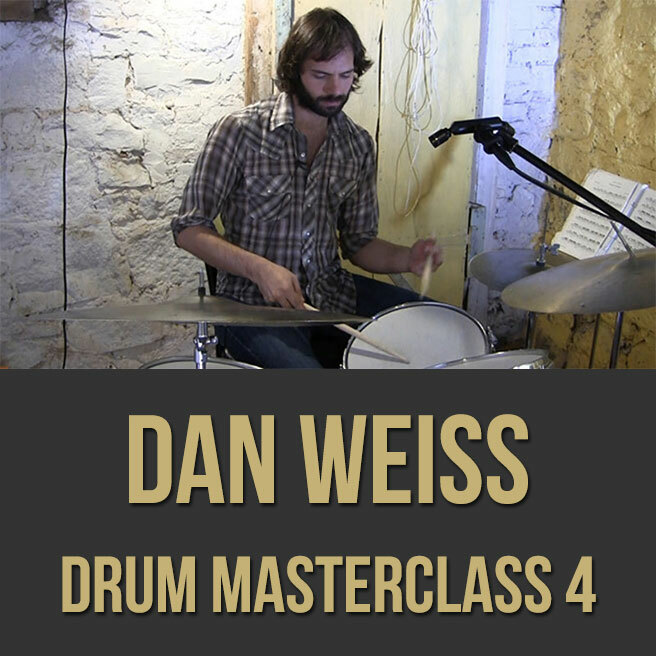 Weiss currently lives in Brooklyn , NY where he continues to study, practice, teach, perform and record.